Cloth-Clip 18X Telephoto Lens for Camera Phones / Tablets (iPhone / iPad / Galaxy Phones) : allputer.com - Accessories for all your Portable Electronics & Computers! Photography is art which needs the help of technology. With the latest smartphones, you can take along amazing photography devices with you without the extra baggage of huge DSLRs. - Universal for almost all the smartphones. - Easy for carrying and simple operation. 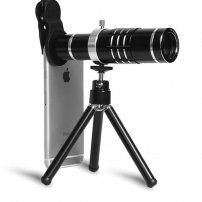 - An amazing phone lens attachment kit with 18X magnification, Works like a telescope, you can turn the objective lens to focus on any parts of the view to observe or take photos. - Excellent for taking pictures or videos of long distance objects, like buildings, landscapes, concerts, travel, animal observation, etc, get better pictures without buying a big camera. - The Cloth Clip / Hanger Clip for this set it not necessary compatible for other category product. - To have best picture result, please consider those customized lens set for the dedicated phone model.